The best way to get to know a community is by scheduling a tour. See the facilities, meet the staff and residents, and get a feel first hand what it's like to live at Meadow Brook Senior Living Assisted Living. 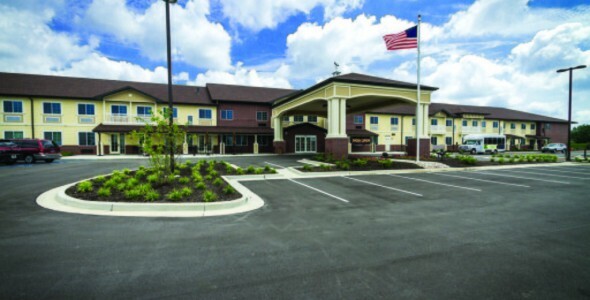 Nestled in the upscale comunity of Fishers, just a quick drive north of Indianapolis, Meadow Brook Senior Living is a newly built retirement community that has all the amenities seniors need to continue living an independent lifestyle. From our At Your ServiceSM hospitality to our engaging activity program, families won't find a better place for their loved one to call home. Meadow Brook Senior Living is owned and operated by Spectrum Retirement Communities, LLC, a leading developer of retirement communities across the country. At Spectrum, our goal is to provide affordable luxury living to all seniors. Our luxurious accommodations come in a range of studio, one- adn two-bedroom floor plans. All apartment homes come with kitchenettes, private bathrooms, in-suite climate controls and 24-hour emergency calls systems for added safety and security. The assisted living apartments also have the convenience of a washer/dryer. Life at Meadow Brook Senior Living is always dynamic and exciting with on-site amenities such as a full-service beauty salon and day spa, a state-of-the-art exercise and physical therapy center and an in-home theater for live entertainment. There are also lounges with fireplaces that make for cozy areas to gather with friends and family. To support our residents' desire for independence, we craft a care plan that outlines the level of assistance with activities of daily living that is needed. We also provide in-house physical, occupation and speech therapy, along with monthly health screens and blood pressure checks. For residents requiring memory care, our The Path to the PresentSM allows them to continue living an engaging life. Meadow Brook Senior Living is the community of choice for families seeking assisted living services delivered by a highly qualified staff.